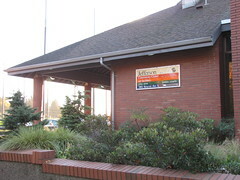 Jefferson Park Community Center. Photo by Wendi. Seattle Parks and Recreation has been challenged by the City Council to re-think the way community centers should operate in this time of budget difficulties. A citizen advisory team has worked for a while on developing new ideas for the operation of the centers, and now Parks would like to hear from residents in the wider community at two meetings, one at Bitter Lake in the far North End, and the other right here on Beacon Hill. All are welcome to attend. The Bitter Lake meeting is on Wednesday, June 15, 7 – 8:30 p.m., at Bitter Lake Community Center, 13035 Linden Ave. N. The Beacon Hill meeting is the next day, Thursday, June 16, 7 – 8:30 p.m., at Jefferson Community Center, 3801 Beacon Ave. S.
A draft of the options that have been proposed so far will be available tomorrow, June 8, at all community centers and on the Seattle Parks and Recreation website. There will also be an online survey posted on the same website starting June 8 which you may fill out if you’re unable to attend the community meetings. For further information, please contact Susan Golub at susan.golub@seattle.gov.